– французский физико-химик, специалист в области радиохимии и физики атомного ядра. Родилась в Париже, отец – француз Пьер Кюри, мать – полька Мария Склодовская. Ее родители были не просто учеными; мать – первый исследователь радиоактивности, первая женщина – лауреат Нобелевской премии (она получила ее дважды – по физике и химии). Ирэн пошла по ее стопам. Она вышла замуж за коллегу по Институту радия Фредерика Жолио (1900–1958). В 1935 супруги Жолио-Кюри получили Нобелевскую премию за открытие новых радиоактивных элементов. В конце 1930-х Ирэн вплотную подошла к открытию расщепления атома урана. Во время войны ее муж был в Сопротивлении, а она с детьми бежала в Швейцарию. После войны стала директором Института радия. Работала во Всемирном Совете Мира. Высокая, худенькая, прославившаяся своим терпением и ровным характером, она любила кататься на лыжах, плавать, ходить по горам. Но работа с радиоактивными элементами дала себя знать. Ирэн умерла от острой лейкемии. Ирэн и Фредерик Жолио-Кюри в лаборатории. 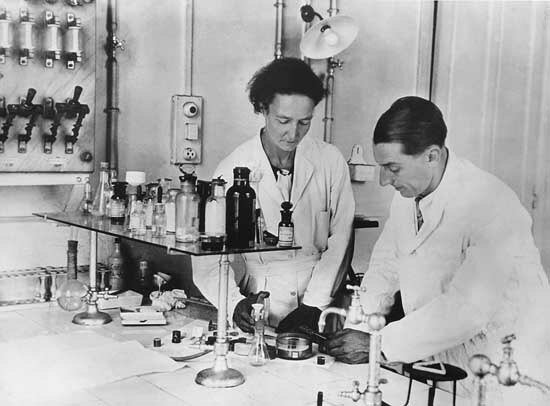 Irène and Frédéric Joliot-Curie in their laboratory. одухотворенный разум Эйнштейна, Планка, Кюри, совершавших подвиги своих грандиозных открытий, просвещался и озарялся инспирацией даймонов (2: 452). 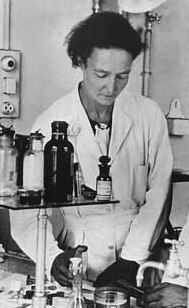 was French physical chemist, who was together with her husband Frédéric Joliot-Curie (1900–1958) awarded the 1935 Nobel Prize for Chemistry for their discovery of new radioactive isotopes prepared artificially. They were the son-in-law and daughter of Nobel Prize winners Pierre and Marie Curie. died March 17, 1956, Paris. Irène Curie from 1912 to 1914 prepared for her baccalauréat at the Collège Sévigné and in 1918 became her mother's assistant at the Institut du Radium of the University of Paris. In 1925 she presented her doctoral thesis on the alpha rays of polonium. In the same year she met Frédéric Joliot in her mother's laboratory; she was to find in him a mate who shared her interest in science, sports, humanism, and the arts. As a boarding student at the Lycée Lakanal, Frédéric Joliot had distinguished himself more in sports than in studies. Reversals of family fortune had then forced him to choose a free public education at the Lavoisier municipal school in order to prepare for the entrance competition at the école de Physique et de Chimie Industrielle, from which he graduated with a degree in engineering, ranking first. After completing his military service, he accepted a research scholarship and, on the recommendation of the physicist Paul Langevin, was hired in October 1925 as Marie Curie's assistant. The following year (on October 9, 1926) Frédéric and Irène were married. Joliot simultaneously pursued new studies to obtain his licence ès sciences in 1927, taught at the école d'électricité Industrielle Charliat in order to augment his finances, and learned laboratory techniques under the guidance of Irène Curie. Beginning in 1928 they signed their scientific work jointly. In the course of their researches they bombarded boron, aluminum, and magnesium with alpha particles; and they obtained radioactive isotopes of elements not ordinarily radioactive, namely, nitrogen, phosphorus, and aluminum. These discoveries revealed the possibility of using artificially produced radioactive isotopes to follow chemical changes and physiological processes, and such applications were soon successful; the absorption of radioiodine by the thyroid gland was detected, and the course of radiophosphorus (in the form of phosphates) was traced in the metabolism of the organism. The production of these unstable atomic nuclei afforded further means for the observation of changes in the atom as these nuclei broke down. The Joliot-Curies observed also the production of neutrons and positive electrons in the changes that they studied; and their discovery of artificial radioactive isotopes constituted an important step toward the solution of the problem of releasing the energy of the atom, since the method of Enrico Fermi, using neutrons instead of alpha particles for the bombardments which led to the fission of uranium, was an extension of the method developed by the Joliot-Curies for producing radioelements artificially. In 1935 Frédéric and Irène Joliot-Curie were awarded the Nobel Prize for Chemistry for the synthesis of new radioactive isotopes. The Joliot-Curies then moved into a home at the edge of the Parc de Sceaux. They left it only for visits to their house in Brittany at Pointe de l'Arcouest, where university families had been meeting together since the time of Marie Curie. And, for the sake of Irène's lungs, they visited the mountains of Courchevel during the 1950s. Frédéric, appointed professor at the Collège de France in 1937, devoted a part of his activities to preparing new sources of radiation. He then supervised the construction of electrostatic accelerators at Arcueil-Cachan and at Ivry and a cyclotron of seven million electron volts at the Collège de France, the second (after the Soviet Union) installation of equipment of this type in Europe. Irène then devoted her time largely to the upbringing of their children, Hélène and Pierre. But both she and Frédéric had a lofty idea of their human and social responsibilities. They had joined the Socialist Party in 1934 and the Comité de Vigilance des Intellectuels Antifascistes (Vigilance Committee of Anti-Fascist Intellectuals) in 1935. They also took a stand in 1936 on the side of Republican Spain. Irène was one of three women to participate in the Popular Front government of 1936. As undersecretary of state for scientific research, she helped to lay the foundations, with Jean Perrin, for what would later become the Centre National de la Recherche Scientifique (National Centre for Scientific Research). Pierre and Marie Curie had decided to publish everything. This was also the attitude adopted by the Joliot-Curies for the discovery of artificial radioactive isotopes. But anxiety resulting from the rise of Nazism and the awareness of the dangers that could result from the application of chain reactions led them to cease publication. On Oct. 30, 1939, they recorded the principle of nuclear reactors in a sealed envelope, which they deposited at the Académie des Sciences; it remained secret until 1949. Frédéric chose to remain in occupied France with his family and to make certain that the Germans who came into his laboratory could not use his work or his equipment, whose removal to Germany he prevented. The Joliot-Curies continued their research, notably in biology; after 1939, Frédéric demonstrated, with Antoine Lacassagne, the use of radioactive iodine as a tracer in the thyroid gland. He became a member of the Académie de Médecine in 1943. But the struggle against the occupying forces began to require more and more of his attention. In November of 1940 he denounced the imprisonment of Paul Langevin. In June of 1941 he took part in the founding of the National Front Committee, of which he became the president. In the spring of 1942, after the execution by the Nazis of the theoretical physicist J. Solomon, Frédéric joined the French Communist Party, of which in 1956 he became a member of the central committee. He created the Société d'études des Applications des Radio-éléments Artificiels, an industrial company that gave work certificates to scientists and thus prevented their being sent to Germany. In May 1944, Irène and their children took refuge in Switzerland, and Frédéric lived in Paris under the name of Jean-Pierre Gaumont. His laboratory at the Collège de France, at which he organized the production of explosives, served as an arsenal during the battle for the liberation of Paris. In recognition, he was designated a commander of the Legion of Honour with a military title and was decorated with the Croix de Guerre. In France, after the liberation in 1944, Frédéric was elected to the Académie des Sciences and was entrusted with the position of director of the Centre National de la Recherche Scientifique. Then, in 1945 General de Gaulle authorized Frédéric and the minister of armaments to create the Commissariat à l'Energie Atomique to ensure for France the applications of the discoveries made in 1939. Irène devoted her scientific experience and her abilities as an administrator to the acquisition of raw materials, the prospecting for uranium, and the construction of detection installations. In 1946 she was also appointed director of the Institut du Radium. Frédéric's efforts culminated in the deployment, on Dec. 15, 1948, of ZOE (zéro, oxyde d'uranium, eau lourde), the first French nuclear reactor, which, though only moderately powerful, marked the end of the Anglo-Saxon monopoly. In April 1950, however, during the climax of the cold war and anticommunism, Prime Minister Georges Bidault removed him without explanation from his position as high commissioner, and a few months later Irène was also deprived of her position as commissioner in the Commissariat à l'Energie Atomique. They devoted themselves henceforth to their own laboratory work, to teaching, and to various peace movements. Irène wrote the entry on polonium for the 1949 printing of the 14th edition of the Encyclopædia Britannica. During the 1950s, following several operations, Irène's health began to decline. In May of 1953 Frédéric had the first attack of hepatitis from which he was to suffer for five years, with a serious relapse in 1955. In 1955 Irène drew up plans for the new nuclear physics laboratories at the Université d'Orsay, south of Paris, where teams of scientists could work with large particle accelerators under conditions less cramped than in the Parisian laboratories. Early in 1956 Irène was sent into the mountains, but her condition did not improve. Wasted away by leukemia as her mother had been, she again entered the Curie Hospital, where she died in 1956. Ill and knowing that his days were also numbered, Frédéric decided to carry on Irène's unfinished work. In September 1956 he accepted the position of professor at the University of Paris left vacant by Irène, at the same time occupying his own chair at the Collège de France. He successfully completed the establishment of the Orsay laboratories and saw the start of research there in 1958. Cotton, Eugénie. Les Curie. – 1963. # Contains recollections of the Curie family and an assessment of their scientific accomplishments. Веб-страница создана М.Н. Белгородским в декабре 2010 г.
and last updated on September 29, 2013.